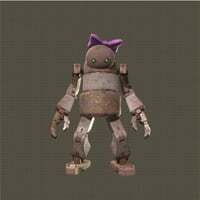 Little Sister Machine is an NPC in Nier: Automata. "A little-sister machine lifeform that got lost in the desert. According to Pascal, she's a good-natured girl who cares deeply for her older sister. Filled with curiosity, she spent most of the trip home bombarding 9S with uncountable questions. She returned home on her own after being escorted to the desert's entrance." "tell me how to make a children mister"